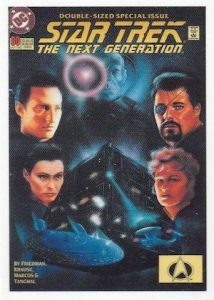 2016 Rittenhouse Star Trek The Next Generation Portfolio Prints Series 2 fills in the gaps from the Series 1 set released in 2015. Continuing the format and art theme, Series 2 also includes three autographs per box. 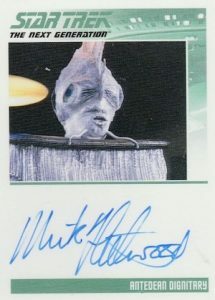 The base set includes 88 cards, one for each remaining episode, and brings the overall total between the two series releases to 177 cards. Gold parallels (1:24 packs) add a facsimile signature for the set's artist, Juan Ortiz, and an Autograph parallel (1:48 packs) showcases Ortiz's authentic signature. Premium hits in 2016 Rittenhouse Star Trek The Next Generation Portfolio Prints Series 2 center around an Autograph checklist of 50+ options. 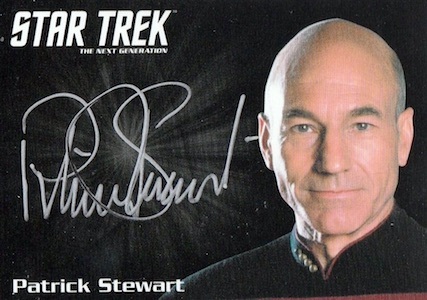 Averaging 1:8 packs, key signers include Patrick Stewart and Michael Dorn. Collectors can find the standard vertical design, heavy on green, as well as a horizontal Silver Signature version that features several of the top names. 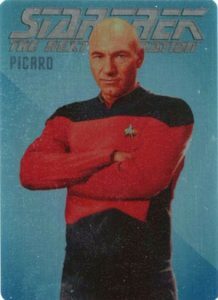 Other notable pulls in Series 2 include case-hit Sketch Cards (1:288 packs) along with Metal Cards (10 cards; 1:288 packs - #/100) that highlight Silhouette Gallery Art and TNG Rendered Art. 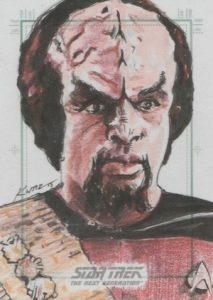 TNG Comics Archive Cuts (40 cards - 1:48 packs) include comic panels from original versions of the 1989 release. 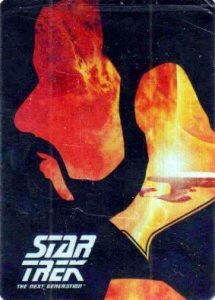 Collectors can also find more standard inserts in 2016 Rittenhouse Star Trek The Next Generation Portfolio Prints Series 2. 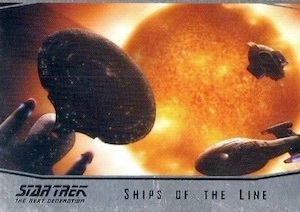 Both offering nine cards, Ships of the Line (1:48 packs) points out key vessels from the show and TNG Universal Art (1:24 packs) takes a character approach. Finally, TNG Comics (1:24 packs) features a detailed look at the 1989 comic with 40 cards. 88 cards. Shop for complete base sets on eBay. PARALLEL CARDS: Gold #/125 (1:24 packs), Juan Ortiz Autograph (1:72 packs). 1 card. 6-Case purchase incentive. 1:288 packs. Full artist list below. Determine the artist with the Rittenhouse identification guide. SP Print Runs: L = Limited 75+ copies, VL = Very Limited 50-75 copies, EL = Extremely Limited 25-50 copies, S = Scarce 25 or less copies. 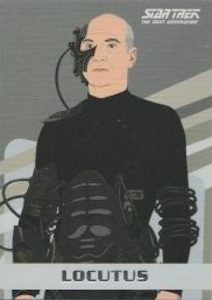 CT2 "I Am Locutus Of Borg. Resistance Is Futile"